The University of Kansas’ football program dates back to 1890, making it one of the oldest in the nation. The team currently has an all-time record of 573-570-58 and a postseason bowl record of 6-6. The Jayhawks have six conference titles and one BCS bowl game victory – the 2008 Orange Bowl. Kansas’ first coach was Dr. Edwin Mortimer “E.M.” Hopkins, who actually had never played or coached football upon being hired to lead the Jayhawks. 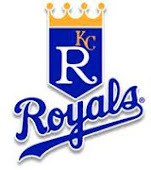 Kansas believed that after spending time on the east coast, he would have a solid understanding of the game. In its first season under Hopkins, KU would finish undefeated with a 7-0-1 record. Alvin Wayland Shepard took over for Hopkins for the next two seasons, serving as a player coach while playing right end. Shepard compiled a 9-6 record as KU’s football coach. Kansas would rotate coaches over the next decade, with several coaches who usually finished the season with a winning record. 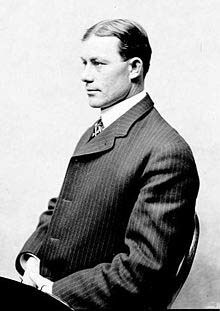 Most notable of all of these was Fielding H. Yost, who would later win six national championships while coaching at the University of Michigan. Yost lead the KU Jayhawks to a 10-0 record in 1899. The KU football team would not find any consistency at head coach until it hired A.R. Kennedy in 1904. Kennedy, a former player at the University, coached from 1904 through 1910, amassing a record of 52-9-4. His 52 wins still stand as the most in program history, and he ranks second is winning percentage. Kansas would continue to cycle through head coaches rapidly, and were even coached by legendary KU basketball coach Phog Allen for one season in 1920. In 1946, Kansas hired George Sauer to be its next head coach. Sauer lead the Jayhawks to a solid 7-2-1 record in his first season, but it was the next year that the program had its first major breakthrough. Kansas compiled an 8-1-2 record in 1947, including an undefeated 4-0-1 Big Six Conference record. As a result, the program was selected to play in the Orange Bowl. The Jayhawks lost a close contest to the Georgia Tech Yellow Jackets, 20-14, and finished the season ranked 12th in the final AP poll. Sauer then decided to leave Kansas to coach at Navy, where he only lasted two seasons and failed to win a game in 1948. Following the departure of Sauer, Kansas would fail to win another bowl game until 1961, when Jack Mitchell guided the program to a victory in the Bluebonnet bowl. This would be the highlight of Mitchell’s tenure, in which he compiled a 42-44-5 record over nine seasons. Mitchell’s 42 wins ranks him fourth at Kansas in terms of total wins. Franklin “Pepper” Rodgers would succeed Mitchell, and lead Kansas to one of its best seasons in program history in only his second season. In 1968, the Jayhawks finished 9-2, including a 6-1 Big 8 Conference record, earning a big to the Orange Bowl. 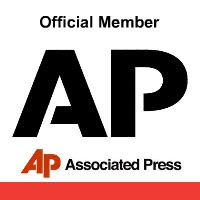 Kansas lost to Penn State, 15-14, and wound up ranked seventh in the final AP poll. Despite narrowly losing the Orange Bowl, Rodgers’ team struggled to a 1-9 record the next season. After finishing 5-6 in 1970, Rodgers accepted the head coach position at UCLA. 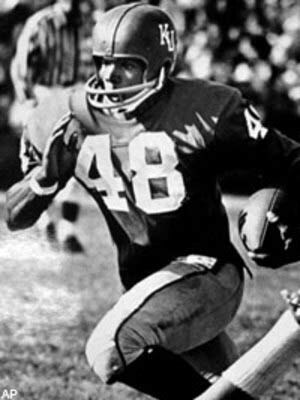 Don Fambrough succeeded Rodgers, and held two separate stints as Kansas’ coach over the next decade, leading the Jayhawks from 1971-1974 and from 1979-1982. In his eight seasons as head coach, Fambrough only produced two winning seasons, and the Jayhawks lost in their bowl games at the end of each. Fambrough compiled a 37-49-5 overall record for the KU football program. In between Fambrough’s two tenures, Kansas was coached by Bud Moore. Moore was named Big Eight Coach of the Year in his first season, leading the Jayhawks to a 23-3 upset over eventual national champion Oklahoma and also breaking the Sooners’ 28-game winning streak. Moore’s 1975 team finished 7-5; however the team would lose in the Sun Bowl to Pittsburgh, 33-19. After a 6-5 season in 1976, Moore’s teams began to struggle. KU finished 4-6-1 in 1977 and had a disastrous 1-10 record in 1978, bringing an end to Moore’s stint as Kansas’ coach. Mike Gottfried was hired after Fambrough, joining Kansas after two winning seasons at Cincinnati. While Gottfried never made a bowl game, his teams improved by one game every season – the Jayhawks went 4-6-1 in 1983, 5-6 in 1984 and 6-6 in 1985. After 1985, Gottfried decided to leave the Jayhawks and accept the head coaching job at Pittsburgh, where he would coach for four more seasons. Gottfried finished his career at Kansas with a 15-18-1 overall record and an 8-13 conference record. His replacement, Bob Valesente, would fare much worse. Valesente only lasted two seasons in Lawrence, compiling a 4-17-1 record and an 0-14 record against Big Eight opponents. Valesente was fired after a 1-9-1 season in 1987, when the Jayhawks lone win came in a 16-15 struggle against Southern Illinois. Valesente’s replacement, Glen Mason, failed to improve the team in his first season, finishing 1-10. However, after winning 7 games combined during the 1989 and 1990 seasons, Mason began to turn the program around. 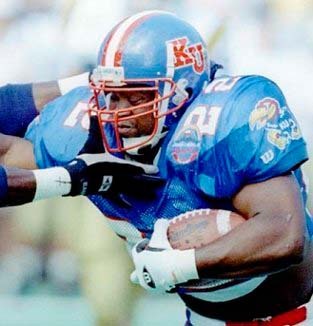 Kansas enjoyed a 6-5 season in 1991 before a breakout 8-4 campaign in 1992, in which the Jayhawks won the Aloha bowl. The Jayhawks followed this season with 5-7 and 6-5 campaigns, before Mason led another surprising year. In 1995, Kansas enjoyed one of the best seasons it has had in modern history, finishing 10-2 and winning another Aloha bowl. However, a great deal of controversy surrounded Mason, as he reportedly accepted the University of Georgia’s coaching position as Kansas prepared to face UCLA in the Aloha Bowl before changing his mind and deciding to stay in Lawrence. The next season, Mason’s team finished a disappointing 4-7, and he accepted the head coaching position at the University of Minnesota. Mason finished his career at KU with a 47-54-1 overall record, a 25-38-1 conference record and two Aloha bowl victories. After Mason, Kansas hired Terry Allen, who had enjoyed a great deal of success at the University of Northern Iowa, which competed in the former 1-AA division of college football. In Allen’s first season, Kansas improved, winning three conference games and finishing 5-6 overall. However, Allen would never build on his first season, failing to win more than 5 games in any of his five years as Kansas’ head coach. After a 3-8 season in 2001, in which the Jayhawks only won one conference game, Allen was fired. He ended his career with a 21-35 record overall and a 10-30 conference record. After Allen was fired, Kansas hired Oklahoma’s Offensive Coordinator Mark Mangino to be the new head coach of the Jayhawks. In 2002, the Jayhawks struggled under their new coach, finishing 2-10 and failing to win a single conference game. However, Mangino quickly turned Kansas around, as the team won six games in 2003 and earned a trip to the Tangerine Bowl. This was the program’s first appearance in a bowl game since the Jayhawks beat UCLA in the 1995 Aloha bowl. Kansas would struggle in 2004, losing several close games while the team battled injuries at key positions, most notably quarterback. However, the Jayhawks defeated rivals Kansas State and Missouri, and nearly upset Texas who would go on to win the Rose Bowl. Mangino made headlines after the game in his criticism of a controversial late offensive pass-interference penalty on KU – had the call not been made, Kansas would have run out the clock and won the game. Mangino received a fine for suggesting that the call was made so Texas would earn a BCS bid. In 2005, Kansas had one of the best defenses in all of college football, led by Big 12 Player of the Year linebacker Nick Reid. This experienced Jayhawk squad overcame inconsistency at quarterback and a struggling offense to give Mangino his first winning season as a coach. Kansas also snapped a 36 game losing streak to Nebraska and earned its third straight win over arch-rival Missouri. Kansas defeated Houston in the 2005 Fort Worth bowl and finished the season 7-5. In 2006, Kansas was talented but extremely young, which showed in a frustrating 6-6 campaign. Kansas was involved in many close losses and blew several late fourth quarter leads in losses to Texas A&M, Oklahoma State and Baylor. During a home game against Colorado, Mangino pulled the redshirt off quarterback Todd Reesing when his offense failed to produce any points. Reesing led an inspired comeback in a Jayhawk victory, and Kansas would defeat Iowa State and Kansas State to avoid finishing with a losing record. Despite a 6-6 record, KU was not invited to a postseason bowl game. In 2007, a talented and more experience squad would deliver the greatest season in Kansas football history. The Jayhawks won 11 straight games and reached the second spot in the national polls, the highest ranking in school history. 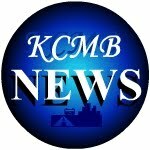 Kansas lost to Missouri in the most anticipated meeting ever between the two rivals; however the school was still invited to play in the Orange Bowl game against Virginia Tech. 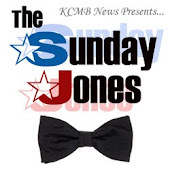 The Jayhawks defeated the Hokies 24-21, giving KU a 12-1 record for the season. The Jayhawks finished the season with the second ranked scoring offense and the fourth ranked scoring defense in the Big 12. 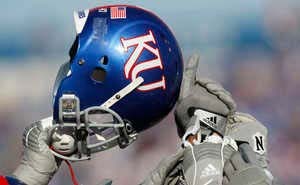 The 2007 season would set the tone for the KU football program for the next several years to come. Big things were expected out of Kansas over the next two seasons, with the return of Reesing and many other key members from the 2007 Orange Bowl team. In 2008, Kansas dealt with a series of injuries all season long, and wound up dropping close games to South Florida, Oklahoma and Nebraska. In the regular season finale, Kansas defeated Missouri in a high-scoring shootout, taking the lead with only seconds left in the game on a fourth quarter touchdown pass from Reesing to WR Kerry Meier. Kansas would defeat Minnesota handily in the Insight Bowl, finishing the season at 8-5. Many predicted that the Jayhawks would have another stellar season in 2009, however Kansas wound up losing its final seven games after starting the season 5-0. The Jayhawks finished the season 5-7 after blowing a late lead to Missouri in the final regular season game, missing out on a third straight bowl trip. After the 2009 season ended, Mangino resigned due to an internal investigation by the University’s Athletic Department in regards to his conduct toward his players. His overall record at Kansas was 50-48, while his conference record was 23-41. Mangino’s 50 wins are the second most in school history. 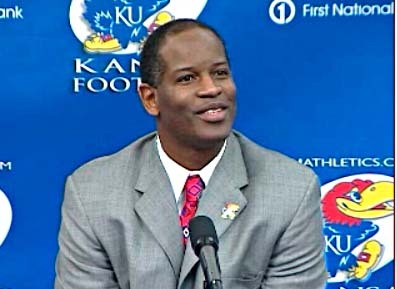 Kansas hired Turner Gill to replace Mangino, after Gill led a well-publicized turnaround at the University of Buffalo. Gill’s tenure got off to a disastrous start, as the Jayhawks dropped their home opener to FCS North Dakota State, 6-3. The next week, Kansas rebounded to upset #15 Georgia Tech, 28-25, however Kansas would struggle once it reached Big 12 play. The lone highlight the rest of the season was a wild comeback win over Colorado, in which KU trailed 45-17 before scoring five unanswered touchdowns to win the game. Kansas finished the season with a 3-8 record, being outscored 413 to 198 for the season (the worst scoring difference since 2002, Mangino’s first season). Gill’s Jayhawks wouldn’t fare any better in 2011. After winning a close contest against Northern Illinois to cap a 2-0 start, Kansas lost every remaining game and finished 2-10. Kansas was outscored 525-238 for the season, and ranked near the bottom in every major statistical offensive and defensive category. Gill was fired after only two seasons, finishing with a 5-19 overall record and a 1-16 conference record. To replace Gill, Kansas hired former Notre Dame head coach Charlie Weis. Weis spent five seasons at Notre Dame’s, compiling a 35-27 record and making a BCS bowl in each of his first two seasons. After Notre Dame, Weis served as the offensive coordinator for the Kansas City Chiefs and later the University of Florida. 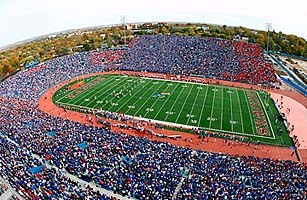 KU is entering its 92nd season of calling Memorial Stadium home, where it has amassed a 244-224-16 record. Memorial Stadium is the first stadium built on a college campus west of the Mississippi River, and is the seventh-oldest college stadium in the United States. Memorial is located at the north base of Mt. Oread at 11th and Maine street, and has a seating capacity of 50,071. The complex has had several major renovations done to it recently, with over $30 million in improvements completed. Memorial is dedicated to the KU students who fought and died during World War I, and the playing field is named after alumnus Tom Kivisto and his family, who have made significant contributions to KU football. KU Football history by KCMB Kansas City News, official kc news site with breaking stories on The Kansas City Royals, Chiefs, charity events, the 2012 MLB All Star Game, weather, sports, MU, KU, ufo sightings, dui checkpoints, Kansas City neighborhoods, nightlife, concerts, the Sprint Center, the Power and Light District and current Kansas City news articles.